Lakota East Dustin Horter breaks three records in the same event at Mason Inv. on May 4, 2018 as runs the mile in a U.S. leading 4:04.82 breaking Mason Ward's 4:07.2 city record set at the Golden West Inv. on June 10, 2000. He also broke his own city record in the 1600m set only last year at the GMC meet and took down Bob Kennedy's all time state record set at the state meet in 1988 of 4:05.13 Finishtiming had FAT clocks at both the 1600m mark and the mile mark. 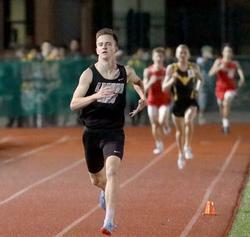 In the photo above Dustin runs away from the field enroute to a 4:03.40 all time state record.